Here come the robo sports journalists. While people in the media biz worry about content mills like Demand Media and Associated Content spitting out endless SEO-targeted articles written by low-paid Internet writers, at least those articles are still written by humans. We may no longer need the humans, at least for data-driven stories. StatSheet started out as basically a stats database for sports junkies. It stores 500 million different stats across most of the major sports. Now, it is taking all of those stats and creating news stories out of them. 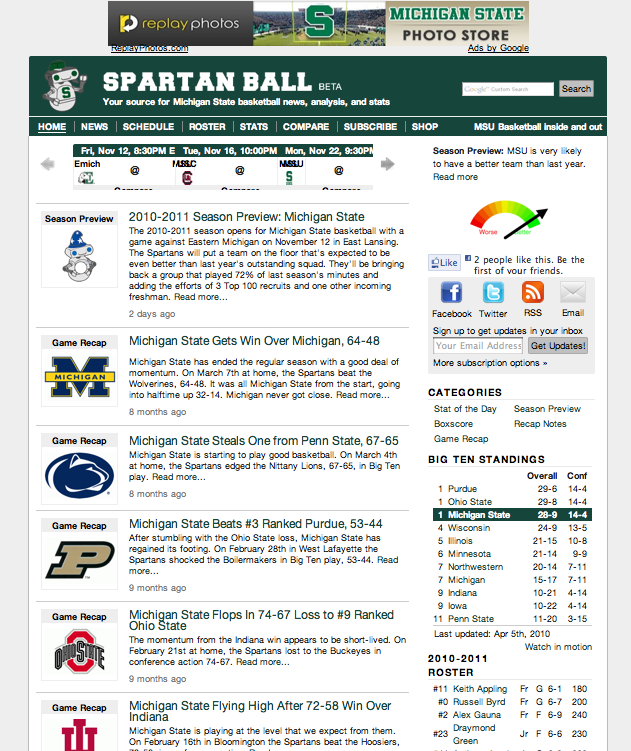 It has about 20 different types of articles that it generates, from season previews to game recaps. StatSheet might analyze 10,000 data points and 4,000 possible phrases to generate a single story. Michigan State has ended the regular season with a good deal of momentum. On March 7th at home, the Spartans beat the Wolverines, 64-48. It was all Michigan State from the start, going into halftime up 32-14. Michigan never got close. Some facts for this matchup: The Michigan State RPI ranking was a good deal higher than Michigan (#26 to #130). The Spartans home court advantage is distinct, and the Wolverines had no momentum and had lost 3 out of 5. The Spartans have already seen the Wolverines this year, and this win gives us a regular season sweep. It’s not exactly riveting sports journalism, but if all you want are the facts, it does the job. I’d still much rather read a sports blogger on SB Nation, or an ESPN article, if it’s available. But compared to some of the content mill stuff, this isn’t half-bad. Each of the 345 team sites will also have their own Twitter account (which is a revival of StatTweets), Facbook Fan Page, and mobile apps to make it even easier to keep up with scores and games.